11-year-old Ethan Palermo uses money from his change jar, “Change the World,” to purchase and donate items for the less fortunate. Ethan Palermo has always been smart with saving money. The 11-year-old from Sicklerville has put loose change in his change jar since he was little, but that money didn’t have significant meaning until last year. His mother, Nicole, told him about a less fortunate family in their community. The parents of a young boy had separated and the mother didn’t have money to buy her son a Christmas gift. Palermo decided to buy the boy a gift with his change so he could open something on Christmas morning. “I decided that I should do something for him because I felt bad for him,” Palermo said. Besides collecting loose change, he sold his toys and also used that money toward purchasing items for the less fortunate. With all the money, he has donated food to a local food pantry, purchased socks for the homeless and created snack packs for patients undergoing chemotherapy. Because of all these good deeds, Palermo was award the National “Youth Hero-Good Deed Award.” According to the American Legion Auxiliary website, it’s an award that “recognizes young girls and boys who are demonstrating a kind of international selflessness.” Susan Griffiths, American Legion president of Auxiliary Unit 281 in Gloucester Township, nominated Palermo for the award. Palermo was surprised with the award at his school, Ann A. Mullen Middle School, on Oct. 20. The Auxiliary wanted to help him continue to help others, so they gave him $100 to go toward his next project. 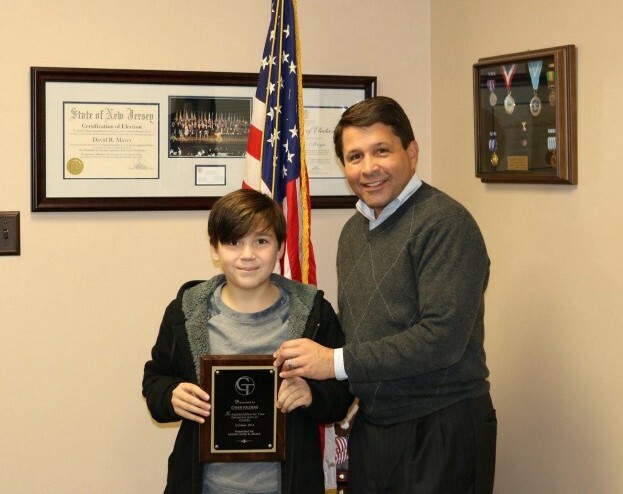 Gloucester Township Mayor Dave Mayer also recognized Palermo at his office in early November by giving him a plaque honoring all the work he has done thus far. Palermo has worked with The Unforgotton Haven in Blackwood, a non-profit organization whose mission is to help the less fortunate, when collecting and donating items. The organization feeds the homeless, assists victims of house fires and collects supplies for veterans. Nicole said when Palermo first got involved with Unforgotten Haven, the item it needed the most at the time was socks for homeless men. As soon as Palermo found out, he bought 10 bags of socks to donate.